As the snow melts and temperatures begin to rise, love is in the air for our furry friends. Spring is the time when cats, dogs, and other pets conceive and birth their young, and it’s crucial for them to be comfortable, safe, and warm during this time. Preparing your home for the arrival of baby animals will not only ease your mind, but help ensure the wellness of your adult animals and their new offspring. 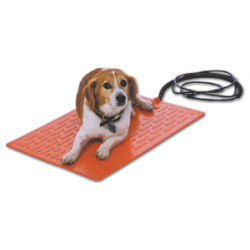 Purchasing an animal heating pad from Osborne Pet Supply is the simplest way to prepare for a new litter of puppies, kittens, or whatever animal babies you’re expecting this Spring. Here are a few other tips that will make the experience easier for all of the two legged, and four legged members of your family. When you find out that one of your beloved pets is going to have a litter of young, house cleaning may not be the first thing that comes to mind, but it should be! Maintaining a clean and sanitary enclosure is important for the health of your pets and their offspring. Remembering to sweep, mop, and rid the floors of small objects is extremely important, especially for baby animals who are wandering around and exploring their new environment. It’s not always easy to spot tiny, but dangerous things on the floor, but being extra vigilant during birthing season will help ensure your pets have the best start. When humans have babies, hospitals offer birthing suites; private and comfortable spaces designed to offer the mother and family a stress-free and calming environment to give birth. In the wild, animals do something similar, finding a secluded and safe space for birthing their young. Why not offer your pet a space with everything they need so they can give birth to their litter in comfort and safety? Creating a space like this is simple. First, purchase an animal heating pad, which offers an ideal sleeping spot to keep both mother and babies warm during cooler weather. Remember to always have additional space in the enclosure for animals to get off the heating pad if they become too warm, and always keep both food and water dishes elevated where only an adult animal can reach. When you’re welcoming a new litter of baby animals, it makes sense to be ready and prepared, not just for their needs, but also for yours! In addition to buying things you know you’ll need for the messes that come with baby animals (like paper towels and natural cleaning spray), consider that you might not want to run out for supplies after labor has begun. Get extras of things you and your pets use often like basic foods, toilet paper, and other necessities. Having these things around will ease your stress and save you time, allowing you to focus on the joy of welcoming new, furry family members into the world.